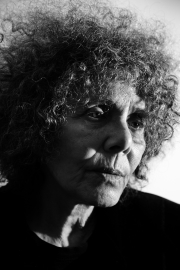 Hedva Harechavi, Israeli poet and artist, was born in 1941 in Kibbutz Degania Bet, She is a mother of one. She has lived most of her life in Jerusalem. Harechavi is a graduate of the Bezalel Academy of Art in Jerusalem. Her art works have been exhibited in one-person shows in Israel and in many group shows in Israel and abroad. 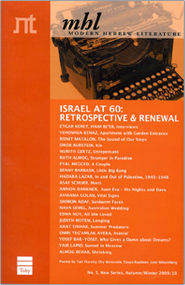 Her first poems published in the Hebrew daily Al-Hamishmar (1967) were submitted for publication by the eminent Hebrew poet Leah Goldberg (1917-1970). Goldberg later selected and prepared for publication Harechavi's first book of Hebrew poetry, Ki Hu Melech (Because He Is A King), 1974, which received the Rachel Newman Poetry Prize. Her poems have been translated into many languages including English, Arabic, Russian and German and have appeared in numerous publications and anthologies. Her major collection of poetry, A Bird that is Inside Stands Outside: Poems, 1962-2008 was published in 2009 by the Kibbutz HaMeuchad and the Bialik Institute in Jerusalem - two of Israel's major publishers of Hebrew poetry. Her most recent book, Rana, was published in 2014 by the Kibbutz HaMeuchad Publisher.